We are moving into comfort food season (even in San Diego - don't try to tell me that we don't have seasons here) and I've been sick so we've been leaning even farther that way. 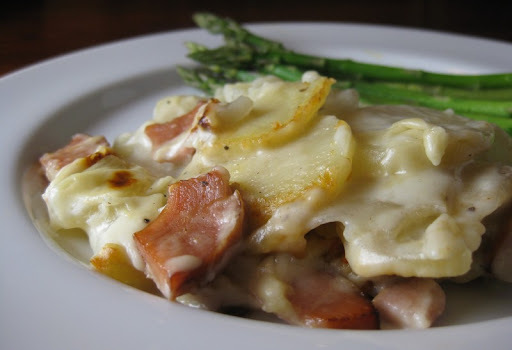 Scalloped Potatoes and Ham is a dish from both of our childhoods. Well, sort of. Sherry's was called Potato-Ham Scallop. I'm pushier than Sherry is, so we make my version. I'm sure I got the recipe from my Mom at some point, but we couldn't find it so Sherry cobbled together a version from two recipes in the good-old "red and white cookbook" (the undisputed king of childhood cuisine, at least for us). We use a vintage (i.e. 80's) edition. 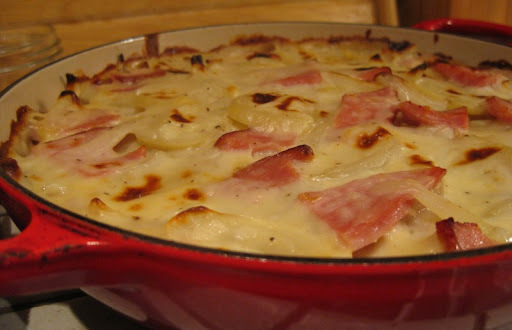 The two recipes are Potato-Ham Scallop (Sherry's childhood dish) and Scalloped Potatoes (which is different in preparation in that it uses a white sauce). The combining of the two recipes (not to mention finding them) is left as an exercise to the reader. The potatoes cook more quickly and evenly in a wide, shallow dish rather than a deep casserole. Pre-heat the oven to 350 degrees. Heat the butter in a medium saucepan. Add the 1/4 cup chopped onion and gently sweat until translucent. Sprinkle in the flour and use a whisk to mix into a thick, somewhat dry paste. Cook 2-3 minutes whisking constantly. Add the milk and whisk until smooth. Season with kosher salt and several grinds of black pepper. Bring to a simmer, stirring occasionally and gently cook for about five minutes. Sauce should be creamy, well seasoned and fairly thick. Spread a couple spoonfuls of sauce onto the bottom of a wide, lidded casserole or braiser. Using about a third of the potatoes, create a layer of slightly overlapping slices in the casserole. Tear the ham slices into uneven pieces and place about a third of them over the potatoes. Follow with about a third of the onion strips and top with a third of the white sauce. Repeat twice more with the remaining potatoes, ham, onions and sauce. If the sauce is too thick to drizzle evenly over the top, whisk it over low heat for a couple minutes or until it loosens sufficiently. Cover the casserole and place into the oven for about 60 minutes. Test the potatoes with a toothpick or fork - when just tender, increase the oven temp to 375 and return the pan to the oven, uncovered for another 15-20 minutes or until the top is lightly browned. Let rest at room temperature 5-10 minutes before serving.